B U B B L E G A R M: My makeup during the day..
My makeup during the day.. I hope you are all having or going to have a fabulous Friday, here is my makeup look for today..
Face - Bourjois 10hr sleep effect foundation, Mac msf natural. Cheeks - Nars Laguna to contour, Prestige Glam tan bronzer to bronze, and Illamasqua Lover blush. Eyes - Prestige Glam tan in crease and lash stiletto mascara. Lips - NYX Tea Rose! I think that Tea Rose is possibly the most flattering lip shade ever! 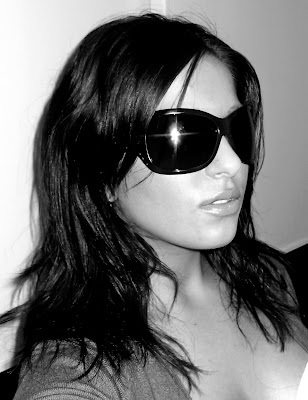 As promised here's a photo of me wearing my Missoni sunglasses.. Onto the hair! Currently I am using John Frieda's Brilliant Brunette illuminating shampoo and conditioner. I am using coconut oil everyday day on the ends of my hair. Once I wash my hair I take a good size blob of the 100% pure coconut oil and run it through my hair which seems to sort it out. (Please do not rush and get the coconut oil, it may be too much for your hair, my hair is a weird texture and gobbles it all up) If I don't oil it, it's disgustingly dry! I washed it last night and slept on it, and this is what it looks like with no heat. A little bit wavy but not quite, Odd! My mum has super straight sleek spaghetti hair whilst my dad has thick coarse afro hair, I guess I'm just an inbetween. It has improved alot, and I am going to continue doing this until I give up :) I can't do the no heat thing, but I will limit the amount of heat that I use on my hair. My husband commented that my hair felt baby soft this morning, which is a rare thing because my hair usually feels like straw - eww! Not good! You look fabulous in this colour!!! The skirt is lovely and green suits you. You look great as always. You seem happy! You look so natural and glowing wearing the Bourjois 10hr sleep effect foundation & Mac msf natural. Your make up looks effortless! @Catanya thank u sweetie :) I love green! You look so different in this look. Your skirt is beautiful - up here in Manchester today it has been cold and windy, so jeans and boots were on the cards outfit wise. I love your hair wavy, and those glasses are perfect for you! The makeup looks great, and it goes perfect with that skirt! I know! ITs so annoying noone can comment. But trying to ask blogger for help is just so redicuous. Ive tried something new again.. but i doubt its fixed. FAB color on you look how your eyes picked up the green!! I like this look.. and the nyx lipstick is fab. Wish the had it here. Im still waititng for my junk to arrive from the us! so glad your hair is feeling healthy, I am also going to give coconut oil a try..
off topic: could you read your bubblegarm mail please..
Beautiful. I actually like you better without the eyeliner. Your eyes seem more alive and wider. I really need to look into that coconut oil. I have thick, coarse, wavy and dry hair. I may benefit from the oil. Does it do good at controlling frizz when you apply it in your wet hair??? Thank u all so much! @nikkiga yes the coconut oil def helps with the frizz!!! hola Bubbles! WHAT A BEAUTY YOU ARE!!!! Oh my gosh, and without your beloved BB moisturizer and foundation and no concealer and Gosh you are just absolutely fabulous daaalin! Seriously, someone said above that you look different somehow, its true. You look really relaxed and rested, and like effortless. U used all the right colours i suppose! Love it and I love your hair like that too and the color looks so rich and lovely against ur complexion! It all just suits u! :) thanks for sharing! loving your outfit. pink and green is fabulous. Cok dogal ve güzel gözüküyorsun, saclarin ve makyajin harika!! Cok begendim masallah!